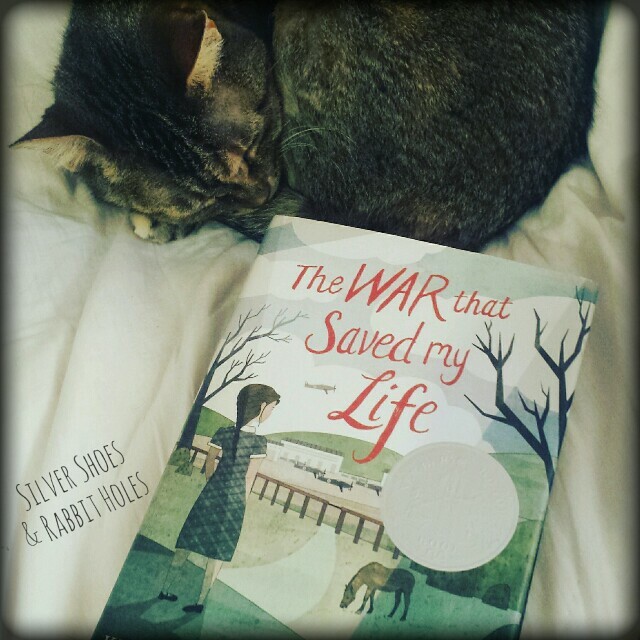 I am a weird book blogger, in that I actually hate writing reviews. I don't consider myself a reviewer at all. I am a sharer. When I like something, I share it. When I love something, I gush about it. It's so much easier to do this with picture books, just so you know. "Look at this book, isn't it pretty, I really liked it!" So... I need to share this book. 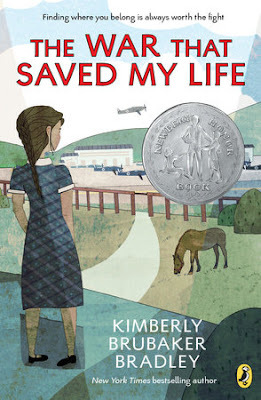 The War That Saved My Life was a Newbery honor book this year. It sounded interesting, so I put it on Big Sis's Amazon wishlist. My sister gave it to her for her birthday. 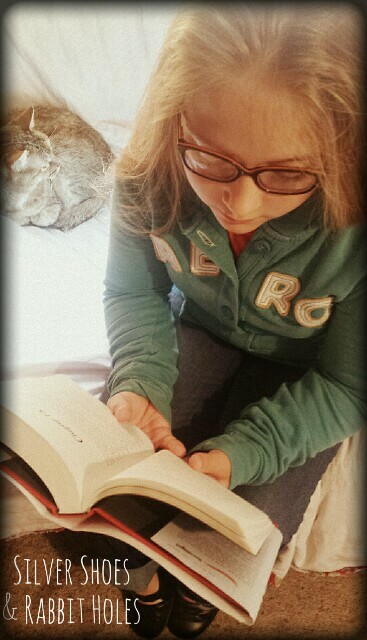 She started reading it at school the other day, and told me that so far, it was excellent. Tuesday nights, I volunteer in the office at the girls' dance studio. I forgot to bring a book - it can be rather slow - so Big Sis lent me her book. After we got home, I stayed up until 2 AM, finishing it. The book begins in London, 1939. Ada Smith (who doesn't know her age) looks after her brother, Jamie, and cooks for her abusive monster of a mother. Ada was born with a clubfoot, but she doesn't know that's what it's called. She believes what her mother tells her: her foot is an abomination, disgusting, and makes her worthless. Mam is physically abusive, as well as mentally, and punishes Ada with blows to the head and by locking her in a cupboard overnight. When Jamie is at school and while her mother is at work, Ada teaches herself to walk, despite the blood and pain. One day, Jamie comes home and tells his mother and sister that the teachers and children are being evacuated. War is coming; London will be bombed. Mam says she may send Jamie away, but not Ada. Who would take her? Ada has other plans. She confesses to Jamie that she has learned to walk, and the morning of the evacuation, she steals a pair of Mam's shoes and together, they sneak to the train station. Ada finds out that the neighbors thought she was "simple." Her Mam had told them as much. She also observes how dirty and ragged she and Jamie are, compared to the other children. When they arrive in Kent, people come to pick through the evacuees, choosing who to take into their homes. No one wants Ada and Jamie. The woman in charge takes them to a house. They hear her arguing with the woman of the house, Susan Smith (no relation). She doesn't want children. She doesn't think she can take care of anyone. The children are left there anyway. She cleans them up, and takes them to the doctor, who examines Ada's foot. He explains her foot could have been fixed by operation as a baby. Now, it would take a bigger operation, and it would never be truly fixed, but could be better. They just need her Mam's permission to operate. For now, Ada is given her first pair of crutches. Susan Smith has her own pain. Her "best friend," Becky, has died, leaving her the house. It becomes fairly clear, if never explicitly stated, that Becky was more than a friend. Susan is dealing with her own feelings of rejection from her family, as well as the depression from her loss. She has Becky's pony, Butter, and Ada teaches herself how to ride him. The book is written in the first person. Ada's voice is a strong one. Early on, she seems so tough, but as the kindnesses pile up, her resolve begins to break. She has panic attacks, fighting against hope. Susan isn't "real." She is only temporary, and she is sure that one day, she will be forced to return to Mam. Of course, the war is there, too. An airfield is built behind the house, and Jamie is fascinated by the planes. On her pony rides, Ada always keeps an eye out for German spies. In many ways, the story does feel familiar: abused children are sent to live with a depressed stranger, and heartwarming things happen. Yet, Ada is such a beautifully realized character, and her emotions felt so true, I found myself immersed in the story. I enjoyed other characters, too, villagers we meet here and there. The book is not as heavy and depressing as you would think. There is actual fun to be had, believe it or not. It's downright charming at times. Who says kids' books are just for kids? So now I'm just waiting for my kid to finish the book. As of tonight, Big Sis is about halfway through it. She's slooooowww! Mommy wants to talk about it nooooooow! both my daughters read this and said it was amazing. your review makes me want to read it too! Mine is still working on it. She read in the car on the way to the barn sale today. She only had the last third to go! It's so lovely. I LOVED THIS BOOK! I hate depressing books, and I worried it might verge that way, but the setting was too enticing for me--I love WWII England. And it was awesome!! I totally understand what you mean about reviewing books. It is really hard for me to be objective about books. If I love a book, I really, really love it and want everyone I know to read it and love it. And I have to really restrain myself from giving all the good parts away. I want everyone to make sure they noticed the good parts!! Also, if I don't love a book, I have a really hard time finding good points about it. Sigh. Maybe I will be objective someday. Yeah, if I don't like a book, I still feel guilty writing anything negative, because authors are people, too! They may read my harsh words, and I hate being mean. Haha!